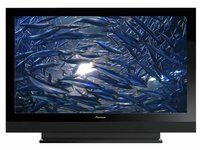 After stunning CES in 2007 with its 8G Kuro plasma TVs, in 2008 Pioneer has once again sent shock waves rippling through the show. It's announced some stunning new advances in its plasma panel technology that will enable it to make better and thinner panels than ever before. The first new product came in the form of an amazing new ultra-thin prototype. At just 9mm thick, it's by far Pioneer's thinnest plasma screen ever. The company has managed to pack all of its industry-leading Kuro technology into a 50-inch panel that's thinner than your little finger. Thinner than an iPhone, in fact. And not only is it ultra-thin, the new display is also super-lightweight. It weighs in at under 19kg. That's about the weight of a small child. Before the 300-strong audience of journalists even had time to even take a breath, Pioneer vice president Russ Johnston then announced what he called the "death of contrast ratio". He says that Pioneer's engineers have managed to eliminate all idling luminance in a new batch of concept plasma panels. What this effectively means is that the next generation of panels will have immeasurable contrast ratios. Blacks will be 100 per cent black with no light leaking through, creating the most colour-accurate displays in the world. "For more than a year, Project Kuro has been a brand mantra within Pioneer that represents our commitment to deliver the most passionate and emotional entertainment experience possible," said Johnston. "The Kuro technology concepts demonstrate how we are continuing to challenge the industry and stay above the commoditised flat panel television market - by literally ending the conversation about contrast ratio, a debate that has been in existence since television was first introduced, and creating a flat panel display so thin it becomes a canvas for entertainment." Contrast ratio is defined as the ratio of the luminosity of the brightest colour (white) to that of the darkest colour (black). While manufacturers all measure this differently, they agree that a high contrast ratio is desirable to recreate ideal picture quality. In televisions, the truer the black, the more accurate the colour. Inside the press conference, the big screen behind Johnston displayed the words: "Black is the most important colour on a display". Johnston said that Pioneer's new displays are so black that when placed in a completely dark room, if no image is being displayed, the television is entirely invisible. Even the best of the current batch of 8G Pioneer plasmas are visible under these conditions because the idling luminance is not zero. But these new prototype panels have a contrast ratio that is literally beyond measurement, they're completely black, and Pioneer says this "renders the debate of contrast ratio irrelevant". Of course, while Pioneer is the only company to be producing panels this good, even it won't stop talking about contrast ratio. This technology is simply too good not to boast about it, so expect to be hearing about contrast ratios for a good few years to come. If you like the sound of this new technology, don't get too excited just yet. None of it will go to market until 2009 at the very earliest. For those who bought Pioneer's current 8G Kuro plasmas, this will probably come as a relief.